SAMUNG INSPIRE THE WORLD WITH THEIR INNOVATIVE TECHNOLOGIES, PRODUCTS AND DESIGN THAT ENRICH PEOPLE’S LIVE AND CONTRIBUTE TO SOCIAL PROSPERITY BY CREATING A NEW FUTURE. 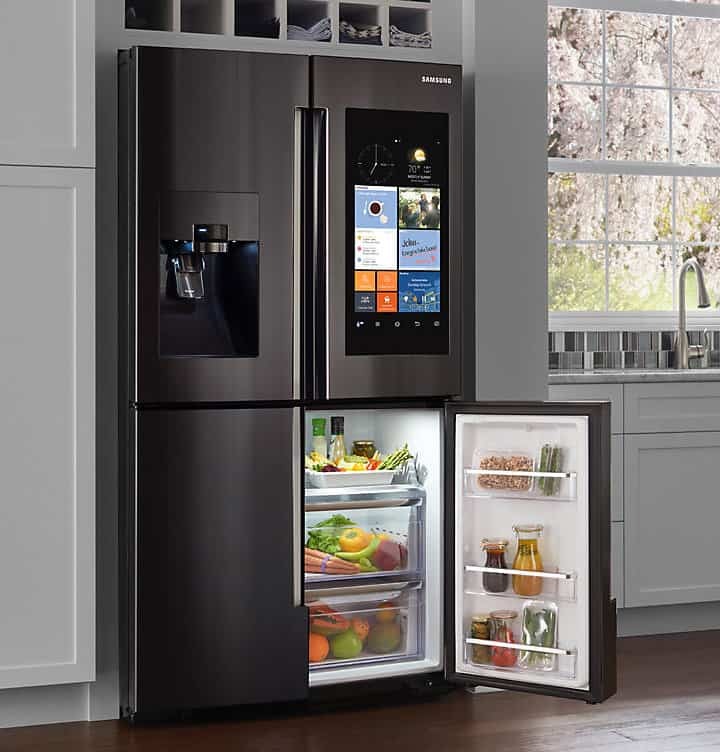 Samsung’s endless innovations in refrigeration has advanced refrigerators to a new level with the Family Hub, a Wi-Fi enabled touchscreen that lets you manage your groceries, connect with your family and entertain like never before. There French Door Refrigerator is stunning and stylish ultra-high capacity saving you trips to the supermarket. Choose from modern designs, with 3-door or 4-door options. With an innovative 2-door system, the Side-by-Side Food Showcase Refrigerator is designed to improve the way you store food. With so many options available, you are bound to find a refrigerator that suits you. Samsung cooking appliances are precise and flexible. Their microwave oven range are stylish and powerful. Enjoy the flexibility to bake and microwave – all from one appliance. With innovative Power Convection, our Microwaves can be used as a second oven, cooking your food food evenly while keeping it crispy on the outside. The professional touch ovens Vapour technology combines the power of vapourised moisture and heat to help ensure food is golden on the outside and succulent on the inside. Their range of washing machines provide innovation for all. The front loaders have Addwash functions just in case you find a last minute item to add to your wash. User are also able to to pop hand-washed clothes in to just rinse or spin dry. New QuickDrive technology has a revolutionary main drum and back plate that rotates independently to create a dynamic double action that washes quickly, powerfully, and gently. Activ DualWash allows your top loader to double as a sink in your laundry for all your stain removal and pre-washing needs. Simply lift the sink to let items fall into the washer. Samsung prides itself on after market support and maintenance offering extended home repair hours, instant response 24/7 call centre and live chat support and home support within 24 hours or on a day that suits you Mon – Sat. Samsung started in 1938 as a small trading company located in Su-dong near Daegu city.It was founded by Lee Byung-chul. He had only forty employees and the company’s major business was production and distribution of groceries within the city. In 1980 they acquired Hanguk Jeonja Tongsin and their development and manufacturing of electronics began. Their home appliance business in the U.S. started to take off in 2005 and in recent years they have steadily gained ground.